While the site selection controversy between the committee representing the Northern Virginia jurisdictions and the University of Virginia Board of Visitors played out during 1956 and 1957, and with classes at the new branch set to begin in the fall of 1957, President Darden announced the temporary leasing of an old elementary school building in Bailey's Crossroads at the intersection of Va. Route 7 and Columbia Pike (Va, Route 244). This building would house the newly created University College of the University of Virginia until a permanent location could be chosen and suitable facilities constructed. In early August of 1957 the Bailey's Crossroads location was occupied by University staff, and classes began on September 23 with an initial enrollment of seventeen. With John Norville Gibson Finley as its director (he oversaw both the Northern Virginia Center at Arlington and the University College at Bailey’s Crossroads from 1957 to 1960), Bailey’s served as the home of the college while the search for a permanent site continued, and for several years after until construction of the new campus was finished. The building was small, and probably did not come close to meeting the standards for a branch college. Because all spaces in the building were in use at all times, there was no place for the students to socialize before and after class. To help remedy this, the Bailey’s Crossroads Volunteer Fire Department next door kindly allowed students of the college to use the station’s upstairs break room as a lounge. Former Bailey’s student Richard Sparks suggests that because the physical plant of the college was so small, “there was no way for students not to get to know each other. There was nowhere to hide out,” and faculty would often catch those who attempted to skip class playing sports on the lawn. The small quarters did allow students and faculty to form close bonds, as they were nearly always together. This is evident in many of Sparks’ original photographs of the Bailey’s Crossroads campus, which now comprise the Richard M. Sparks Photograph Collection. The idea to use the old elementary school building came from lawyer and Fairfax Mayor, John C. Wood. Wood, who would later become the first Rector of the George Mason University Board of Visitors in 1972, was working as the attorney for the Fairfax County School Board in 1957. An early booster of higher education in Northern Virginia, Wood asked the Fairfax County School Board if they would be willing to lease the building to the University temporarily for their new branch college. The School Board offered it the building on a yearly lease. The University was responsible for utilities and insurance. The total move-in and first year’s operations cost of the college was $40,000. This was financed through appropriations by Falls Church, Alexandria, Arlington, and Fairfax County in July 1957. The school also would receive several donations to help them develop a library onsite. President Darden personally made a substantial contribution to begin the library in August 1957. In 1959 a University alumnus and doctor living in the Northern Virginia area donated $1,000 worth of books to the college library, two more Arlington residents gave books valued at $100, and the Clarenford Woman’s Club donated $100 worth of back periodicals. These early examples of support would serve to build the library and offer a greater academic experience to the students at Bailey’s Crossroads. However, these gifts did not come without a price. Every time a donation of books was made to the school, library staff would have to work to find a place to store them. 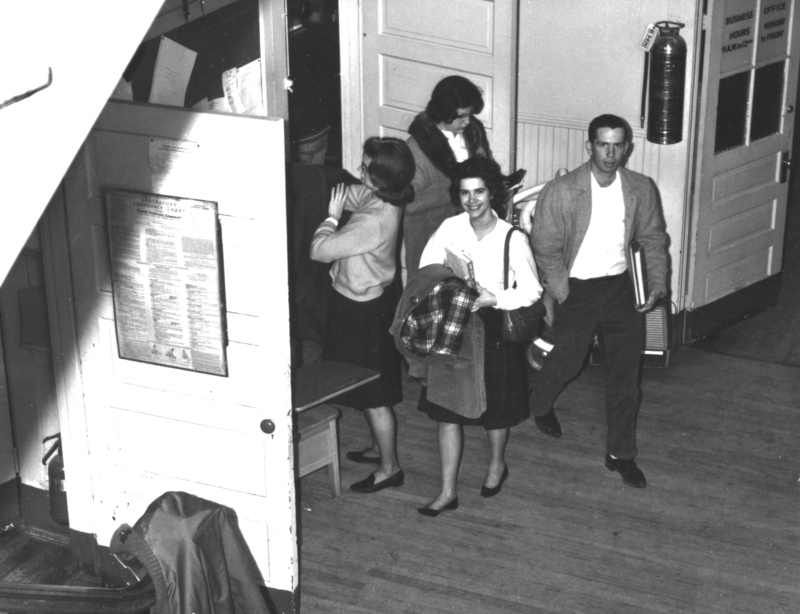 Director Finley wrote in 1959 that “[w]e can squeeze one bookcase more into the library-lounge on the second floor; put two on the stair landing and four in the hall on the second floor.” College staffers sought to store books in nearly every nook and cranny in the cramped schoolhouse. Space for other collegiate pursuits was always at a premium. Bailey’s lacked a room that could house more than 30 persons comfortably. As a result, college functions such as assemblies, meetings, dances, and Final Day Exercises (since there were no terminal degree programs at the branch “Final Day Exercises” were the equivalent of graduation) were held at locations nearby, such as the Bailey’s Crossroads Fire Department, the Alexandria Episcopal Seminary, and local hotels and churches. Athletic events, which were never more than a pick-up or faculty vs. student game, took place either on the dirt field adjacent to the building which doubled as overflow parking, or on the fields of local schools, such as Glen Forest Elementary School, which was located one-half mile to the north. Bailey’s served as the primary location for the University College (which would later be renamed George Mason College in January 1960) from August 1957 until August 1964. Though conditions were challenging for the early pioneers at Bailey’s Crossroads, the students, staff, and local population became fond of their school, and some were even sad to have to leave. The staying power of Bailey’s (or BXU as some students affectionately called it) is a testament to the commitment of the people of Northern Virginia toward higher education. Individuals from all backgrounds and parts of the area labored to make certain that Bailey’s would make a go of it until more permanent quarters were available. This was finally realized on August 27, 1964, when the last of the moving vans left Bailey’s with equipment and furniture bound for the brand-new permanent campus just south of Fairfax. Browse items relating to the Bailey's Crossroads Campus. Minutes of the Advisory Council, October 10 1957, Box 1, Folder 1.14, GMU History 1957 January to October, McFarlane. Sorell p. 218 Full citation: J.N.G. Finley to James W. Cole, Jr., 11 June 1959., President’s Papers, 1959, Series I, Box 7, Folder: Northern Virginia Branch- 1959 (Extens. Div. ), Accession No. RG-2/1/2. 641, Edgar F. Shannon, Jr. Papers, UVA Library.